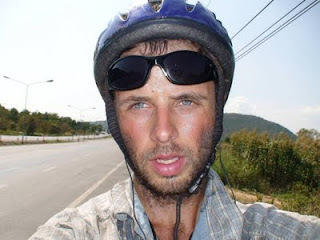 Rob Lilwall was teaching geography at a state school near Oxford when he decided to jack it in, take a one-way flight to the farthest reaches of Siberia and cycle back home to London on his mountain bike. 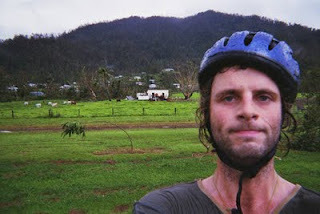 No camera crew, sponsorship or book deal – just him, his Specialized Rockhopper, £8,000 life savings, an impressively flimsy tent and an adventurous spirit. The obvious route would have been to cross Russia into eastern Europe and home. But part-way in, Lilwall decided to go via Australia. The detour doubled the length of his epic trip to three years and 30,000 miles. He set out from Magadan, Russia, on a chilly September day in 2004 – accompanied on this first leg by his friend, Al Humphreys. “Everyone we met said, “Why have you come in September? In a month it will be winter,’” says Lilwall, 32. “They would warn us about wolves, bears, robbers, the biting cold: they all agreed we were going to die, they just couldn’t agree how.” Four days later, the snow arrived. After Siberia, he took a boat to Japan – “I was so happy to be alive” – then on to South Korea, China and Hong Kong. There, he waited three months for a passage to the Philippines with another Englishman, then picked his way down to Australia. It was there he nearly gave up. “I had malaria, I was homesick, exhausted, fed up and my money was running out,” he says. “But I thought, how would I feel if I went home early? That’s what kept me going.” That, and lecturing at schools about his trip to make ends meet. In a world packed with professional adventurers, Lilwall cuts a charmingly innocent figure. He lacks the swagger and privilege of Bear Grylls, Ewan McGregor or Charley Boorman. He is slight, with a warm, sparky face and a cracking dead-pan wit. He was ill-prepared for the trip. “I made up the route as I went along,” he says. “I didn’t know that part of the world, but I saw a string of islands from Japan to Australia so I thought it could be done.” He did no training, his kit was more suited to a festival than the world’s most hostile terrains, and he didn’t try to travel light, lugging War and Peace round Russia, never quite getting round to reading it. Yet what he lacked in army-style preparation, you sense he made up for in personality, making friends easily and networking with aplomb. “I thought three months ahead – emailing anyone who might be able to help,” he says. His teaching must have given him confidence and a thick skin, and he seems relentlessly cheerful. 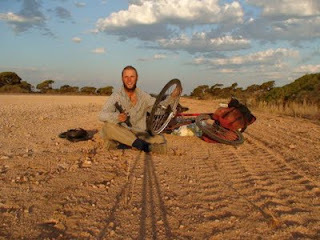 From Perth he took a freighter to Singapore, then cycled through Malaysia up to Vietnam, China again, and to Afghanistan via Tibet and Pakistan. By Turkmenistan, the mercury had hit +40 degrees, “easier than -40”. Three friends joined him for the last leg through Europe. When he reached London, his new girlfriend Christine, whom he met in Hong Kong, was waiting for him. They married three months ago. Then, a stroke of luck: a friend of Christine’s worked in publishing and suggested Lilwall send in a proposal. “Not feeling terribly confident, I did,” he says. It led to a book deal. Ten “emotionally consuming” months later it was finished, and published in September. Lilwall filmed much of his trip, balancing his camera on a rock and cycling past cinematically, or trusting new-found friends with it. In one sequence, in Hanoi, he weaves elegantly through traffic to a stirring soundtrack: scruffy, serene, determined, a bit eccentric and unmistakably English. 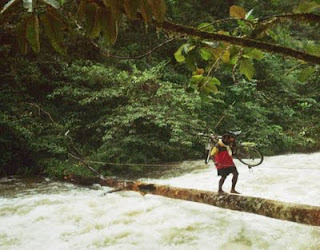 It’s very moving – one man and his bike against the world. 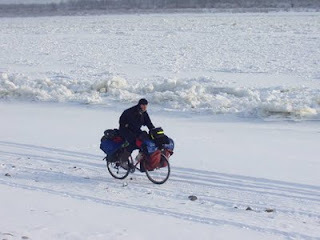 “Cycling Home From Siberia” is published by Hodder & Stoughton, price £12.99 (cyclinghomefromsiberia.com). a really good post. I think you have nailed Rob very well here.